Even while the wound is still fresh from the cancellation of Joss Whedon's Dollhouse, there is still hope in the Jossverse. Star Trek XI is out on DVD. There is a veritable bevy of tech-savvy women out there, some whose works I've been following for years. I am thankful for the inspiration they provide daily. Some of my geek-girl crushes include Kim Dushinski, Heidi Miller, The Blog Squad, Lynette Young, Jessica Sprague, Linda Sattgast, Lorelle VanFossen, Zena Weist, Connie Bensen, Gina Trapani, Renee Pearson, Amy Edwards, & Margie Lundy. 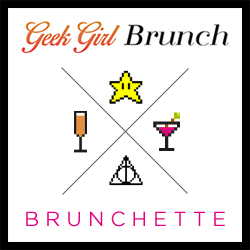 Considering said bevy of geeky women, there are unique networking events just for them, like She's Geeky, Geek Girl Dinners, and BlogHer. Blogging - a forum which allows me to write, even when no one pays me for it, or even particularly cares to read it. font websites like DaFont.com and 1001Fonts.com. I also enjoy the Creative Characters newsletter by MyFonts.com. ...and my most favorite geeky things of all - my husband, daughter, and son. Between gaming, comics/manga/anime, sci-fi/fantasy, debate, band, and IT, they have pretty much every geek category covered. Geeks to the core, every one of them, and I <3 them.